castillo pitched in 6 games down the stretch in 1977, with one win and an era of 3.97. he made one start - the final game of the season against the astros. the dodgers had the division locked up, so they put together a half-hearted line up to face jr richard that day. richard won while striking out 14, and castillo gave up two runs in 6 innings with 4 strikeouts and no walks to earn a no decision. i figured this photo, even though it's on a 1980 issue was from 1977 or 1978 because of the jersey number. however, according to baseball reference, castillo switched to number 37 sometime in the 1979 season. i would have guessed that he switched prior to the start of the season (jerry reuss came aboard in 1979 and took 41) but reuss actually wore 25 to start the year. 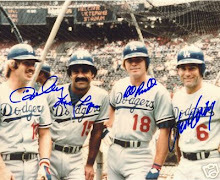 the photo i wound up using is likely from 1981 as it features both castillo and fernando valenzuela. in fact, it was used in the 'fernando nation' film that aired as part of espn's 30 for 30 last week. 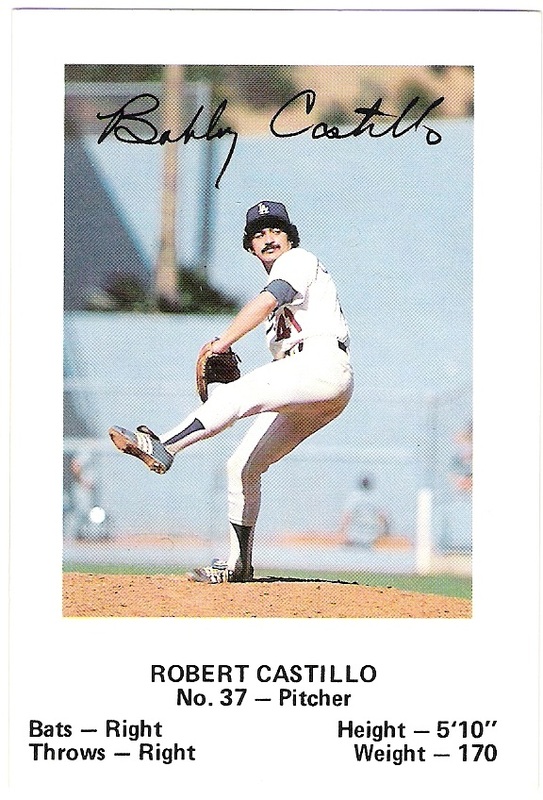 anyway, castillo followed up his 1977 season with 18 appearances in 1978 (all in relief) with an identical era but no wins and 4 losses to go with a save. he went back and forth between the majors and aaa, where he started 14 of the 15 games in which he appeared. he split time between the majors and minors again in 1979, but was up for good after that. 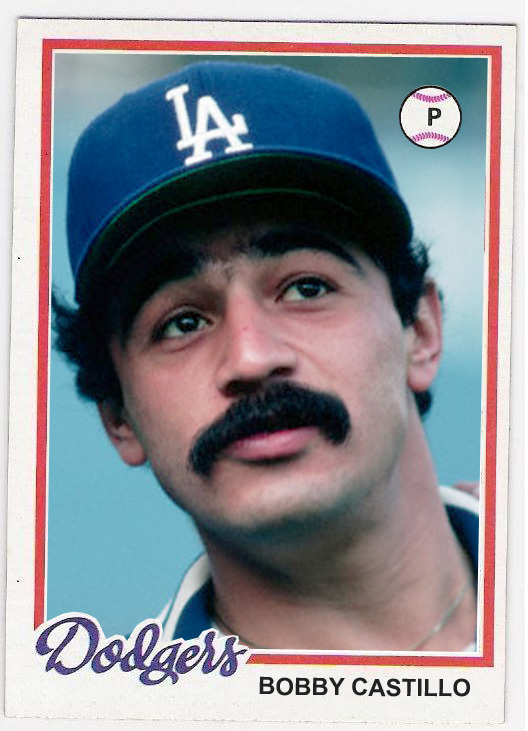 in 1981, castillo appeared in game 1 of the world series against the yankees. in that game, he produced the unlikely pitching line of 1 inning pitched, no hits allowed, 5 walked batters with just one run given up. 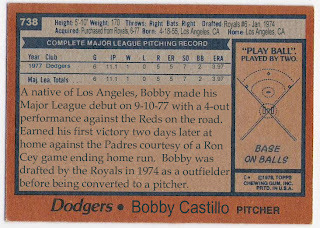 he did it by relieving jerry reuss in the 3rd with a runner on base. castillo walked the first batter he faced but got the next guy to end the inning with a flyout. in the 4th, castillo gave up a walk, fielder's choice groundout (out at second), sacrifice, walk, walk, walk (run scored) before being replaced by dave goltz who got the next batter to pop up and end the inning. 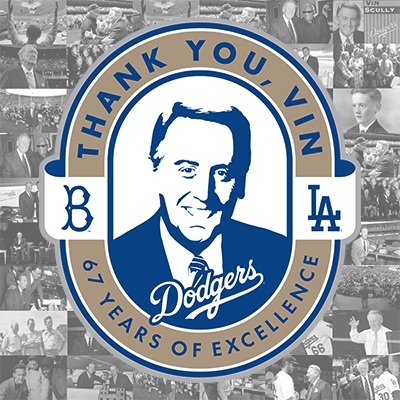 castillo's next and final postseason appearance came in the 1985 nlcs against the cardinals. in between, however, castillo pitched for the twins, primarily as a starter. i'll cover that in a future double dipper post. 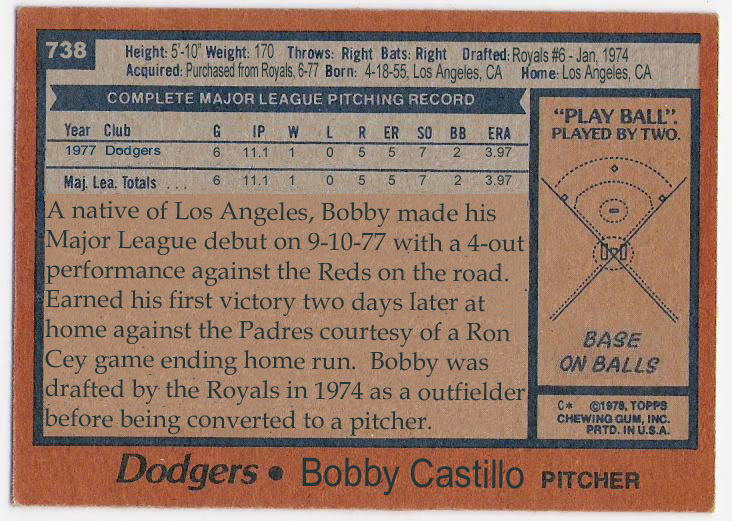 here's to you, bobby castillo and the 1978 topps card that should have been!